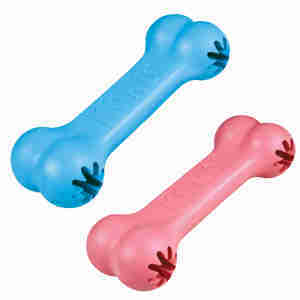 The KONG Puppy Goodie bone is designed to entertain your young puppy and reward them with treats. The bone is made with softer rubber than the classic KONG – perfect for growing teeth. Fill the Goodie Grabber compartments with puppy kibble for extra mental stimulation. Goodie Grabber spots at each end to put treats into the bone. Our puppy loves this product - he prefers it to the other KONG items he has got - the bone always gets a lick and chew. Two new puppies...so will have to get another bone toy! It`s very popular with both pups and easy to stuff with treats. Another excellent kong toy. I can`t recommend this product enough. My Cocker Spaniel puppy is very determined when it comes to chewing (& destroying!) a lot of his toys but this is the only one that has stood the test of time and teething. Now a year old (& many toys later) this Kong toy has lasted him. He especially loves it when his favourite treats or peanut butter are stuffed in to the ends. Every puppy should have one!